The epitaxial planar diffusion process described already is normally employed for the manufacture of IC transistors and diodes. Collector, base, and emitter regions are diffused into a silicon substrate and surface terminals are provided for connection, as illustrated in Fig. 7-20(a). In discrete transistors the substrate is normally used as a collector. If this were done with transistors in a monolithic integrated circuit, all transistors fabricated on one substrate would have their collectors connected together. For this reason, separate collector regions must be diffused into the substrate. Even though separate collector regions are formed, they are not completely isolated from the substrate. Figure 7-20(a) shows that an unwanted (parasitic) pn-junction is formed by the substrate and the transistor collector region. If the circuit is to function correctly, these junctions must never become forward biased. Thus, in the case of a p-type substrate, the substrate must always be kept negative with respect to the transistor collectors, [Fig. 7­20(b)]. This requires that the substrate be connected to the most negative terminal of the circuit supply. The parasitic junctions can affect the circuit performance even when they are reverse biased. The junction reverse leakage current can be a serious problem in circuits that operate at very low current levels. The capacitance of the reverse-biased junction can affect the circuit high-frequency performance, and the junction breakdown voltage imposes limits on the usable level of supply voltage. All these factors can be minimized by using highly resistive (lightly doped) material for the substrate. Integrated circuit diodes are fabricated by diffusion exactly like transistors. Two of the regions are used to form one pn-junction. 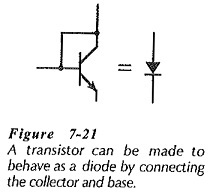 Alternatively, the collector region of a transistor may be connected directly to the base base (Fig. 7-21), so that the device behaves as a diode while operating similarly to a saturated transistor. 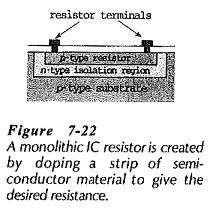 The resistivity of semiconductor material is a function of doping density, so resistors can be produced by doping strips of material and providing terminals, (Fig. 7-22). The range of resistor values that may be produced by the diffusion process varies from ohms to hundreds of kilohms. The typical tolerance, however, may be no better than ± 5%, and may even be as high as ±20%. However, if all resistors are diffused at the same time, then the tolerance ratio can be good. For example, several resistors with the same nominal value may all have a ±20% tolerance, but have actual resistance values within a few percent of each other. Another method of producing resistors for integrated circuits uses the thin-film technique. In this process a metal film is deposited on a glass or silicon dioxide surface. The thickness, width, and length of the film are regulated to give a desired resistance value. Since diffused resistors can be processed while diffusing transistors, the diffusion technique is the least expensive and the most frequently used. Because all pn-junctions have capacitance, capacitors may be produced by fabricating suitable junctions. 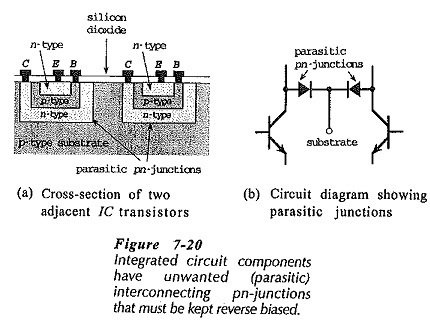 As in the case of other diffused Integrated Circuit Components, parasitic junctions are unavoidable. Both the parasitic and the main junction must be kept reverse biased to avoid direct current flow. The depletion region width and junction capacitance vary with changes in reverse bias so for capacitance value stability, a dc reverse bias greater than maximum signal voltage levels must be maintained across the junction. Integrated circuit capacitors may also be fabricated by utilizing the silicon dioxide surface layer as a dielectric. 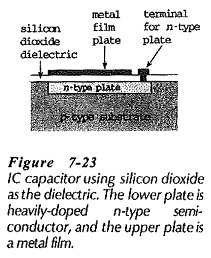 A heavily-doped n-region is diffused to form one plate of the capacitor. The other plate is created by depositing a film of aluminum on the silicon dioxide, (see Fig. 7-23). Voltages of any polarity may be employed with this type of capacitor, and the breakdown voltage is very much larger than that for diffused capacitors. The junction areas available for creation of IC capacitors are very small indeed, so that normally only picofarad capacitance values are possible.